Holly Short is EOIN COLFER'S CHARACTER. Not mine. 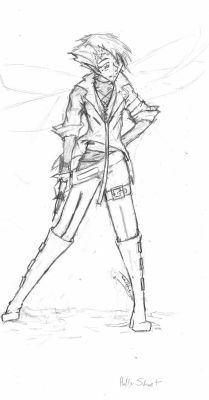 <3 She's from Artemis Fowl and I love her and she's cool and works in LEPrecon (Lower-Elements Police, Recon). And she's a leprechaun. >_<; And she DOESN'T have wings. Steve was a stupid-head and drew them on. Perhaps later I'll make them into the dragonfly model wings, but... eh. Maybe. >_> Hurrah for not knowing what the LEP uniform looks like! Hurrah for making up a design! Making up your own LEP uniform? Thats half the fun of it, right? I love the Uniform! And I shall call you crazy: CRAZY! Yes, I didn't see the wings until I got a bigger view of it. I like it! The wings are really easy to see. You guys need your eyes checked. Anyway, great pic! I really like her pose! She has a great spiky type hair-do! I love it! Is she crying or drunk or is it just me...? Still a good pic though, and the wings are visible though not enough to ruin it. Nice picture. GREAT GREAT GREAT she's really Holly! I luv it!!!!!! This is terrific! I love it!!! I can see the wings! my opinion, UnknownProdigy, is that she's drunk. No matter how un-holly like it is. But nothing against the piccy ,IT'S great!